The retirement concert was for our vice principal Mrs Murphy and one of our teachers Mrs Ennis. It was a surprise so every class learnt a song to sing at the concert. 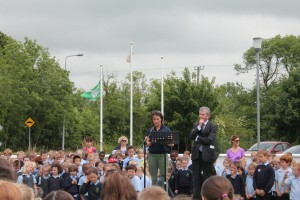 Junior and Senior Infants sang So Long Farewell from the Sound Of Music. First Class sang You Got A Friend in Me. Second Class sang Thank You For The Music. Third Class sang You Can Count On Me. Fourth Class sang These Are The Days and Lean On Me. 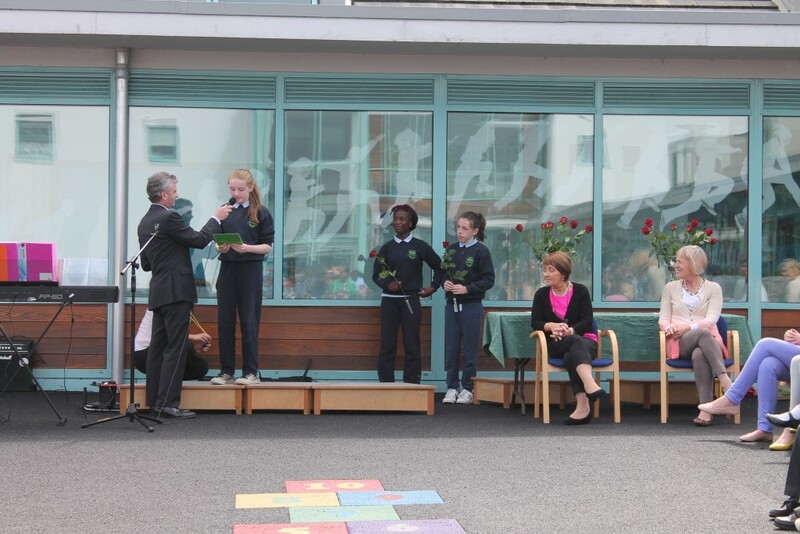 Fifth Class sang Happy and Time of our Life and Sixth Class sang Best Day of Our Lives. The school band and choir also sang It’s Time by Imagine Dragons. 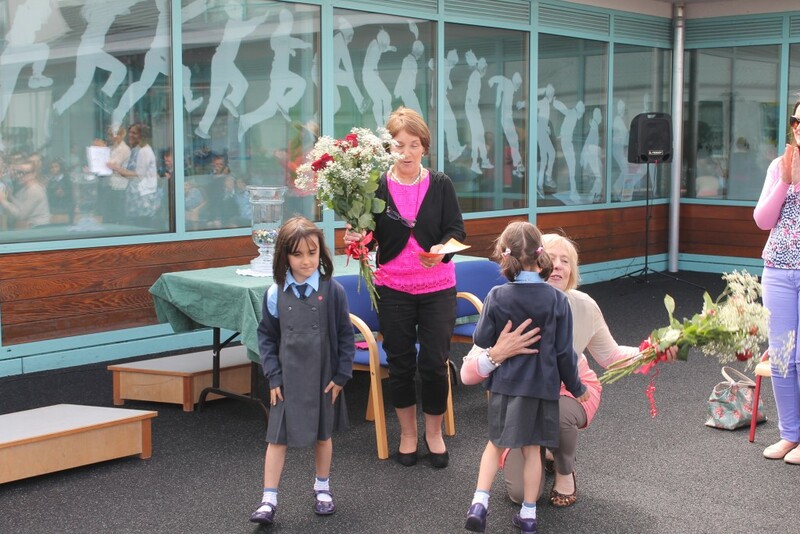 Some students also read a retirement poem and brought up roses for Mrs. Murphy and Mrs. Ennis. They were presented with bouquets after Mr. Lanigan made a speech. Then the whole school sang Favourite Things with the words changed to suit Mrs. Murphy and Mrs. Ennis. It was great to have the whole school together and the weather was beautiful. 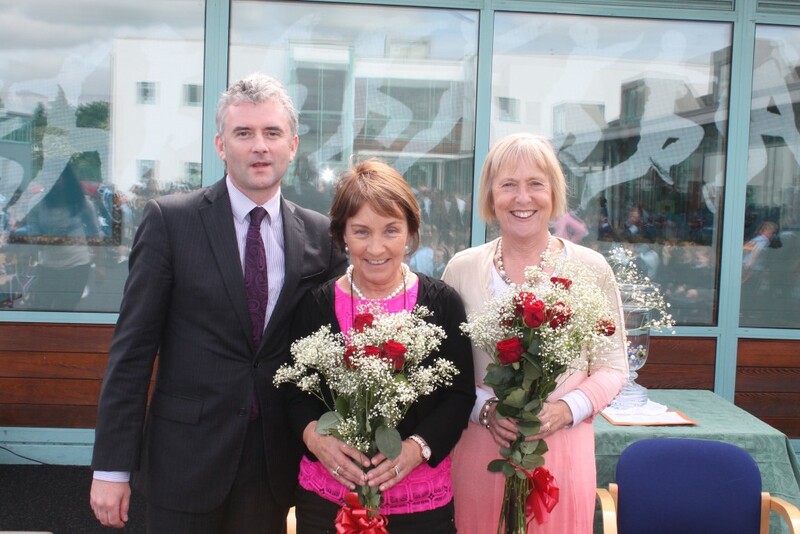 We will really miss Mrs. Murphy and Mrs. Ennis and we hope they will call in to see us some time. Last Thursday, the 25th of June, we raised our Active Flag. We danced the Dino Stomp and we were very good. 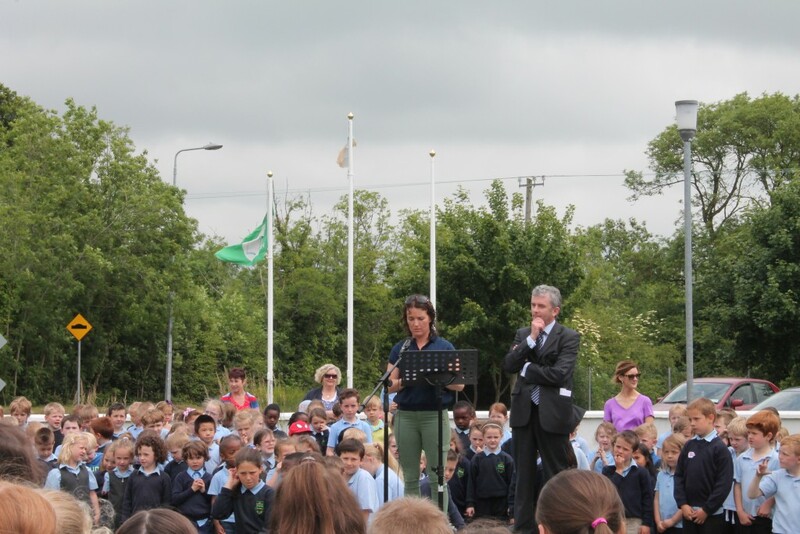 Then one of the members of the Active Schools Committee, Ava Griffith, made a speech. She talked about all the activities that we did for example the 21 day challenge and the Active Week and other things too. After that, our principal, Mr. Lanigan, made another speech. Then Katie Walsh talked to us about always chasing your dreams. She is a famous jockey and has ridden two winners at the Cheltenham festival. She began her riding career in 2003. She was the third woman to win the Irish Grand National. Finally, at one o’ clock, Katie Walsh raised the Active Flag. Everybody cheered loudly when it waved in the wind majestically. This Saturday and Sunday, the 6th and the 7th of June, the three sixth classes are making their Confirmation. This week we have spent a lot of time practising for Confirmation. We have been to the church and we practise our singing everyday. We have learned all of our prayers, readings and hymns. Our teachers have been to the church working so hard for our confirmation. Hopefully we all have a great day. Thanks to all the teachers for their help! 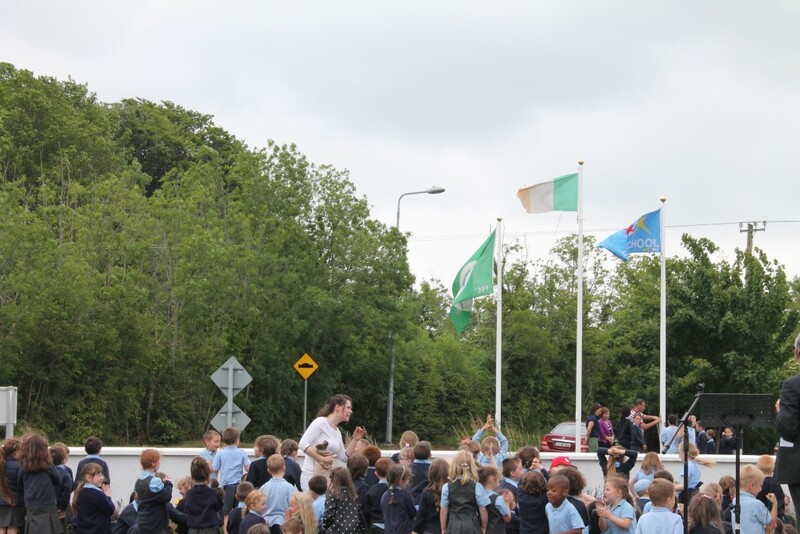 On Thursday 28th May all of the sixth classes went to The Crystal Maze which was on the Cavan/Meath border. The maze was really good. There were riddles and obstacles and a river that we were able to swim in at the end! Sadly, that was our last school tour in Sallins N.S. A couple of weeks ago all of the second classes made their First Holy Communion. Ms.Cullen’s and Ms. Dowler’s classes gathered in the church on Saturday 16th May to celebrate their First Holy Communion, at 11 am and 1 pm. On Sunday, Ms. Culhane’s class made their First Holy Communion at 12 pm. Afterwards all the families met in the Community Centre and enjoyed treats. A great day was had by all! Mr Kelly’s fourth class planted potatoes. 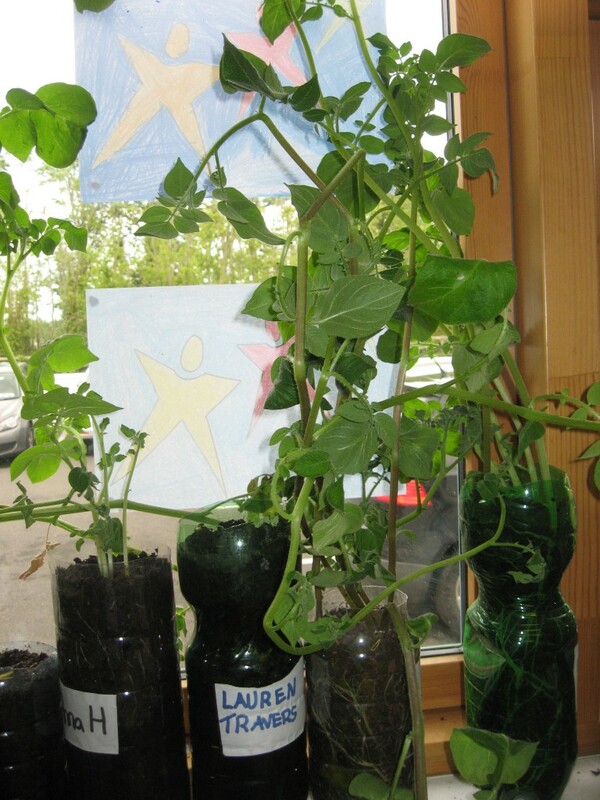 They started by getting bottles to put soil into and then sowed the potatoes. You then put soil on top of the potatoes and it should start growing in a few weeks. If you are lucky the potato should start sprouting. You must watch them carefully! If you see black spots on the leaves, you have potato blight and that would be the end of your potatoes!! This month most of the classes in our school will go on their school tour. We hope to have lots of fun. In the next few weeks an inspector will be coming to see if we can get the Active Flag. We will show him/her our dances, which we have been practising for months.The dances that we will be doing are called Safe Cross Code, Macarena, Step It Up, Dinosaur Stomp, YMCA and The Cha Cha Slide. We have worked very hard so we are hoping to get our Active Flag. During Engineers’ Week, we had a visit from an Engineer. You will find more information and photographs on our website. The 2nd classes were busy making different types of homes while the 6th classes had to make a table that was stable enough to hold to books! Our school got an award for our excellence in science. Have a look at our STEM Showcase on our school website here. On our website we have put up projects, the link is down below if you want to check it out. The Maths projects were from 3rd, 4th and 6th class. You can see these projects if you follow the link down below. Have a look at our website and see our slideshows about 6th class doing Scratch projects and us working on the blog! We have just been awarded the AoSME plaque of excellence in science, technology, engineering and maths. Click on this link below to check out our Science slideshows! Junior infants right up to sixth class have been experimenting! Let us know what you think of all their good work. On Tuesday the 26th of May our girls Gaelic team went to Moorefield to play the final. They played Gael Scoil Chill Dara. Sallins started the match with a goal in the first few minutes. Sallins scored the majority of the scores in the first half. At half time it was 2-4 to 0-2. In the second half it was much more difficult for Sallins because the wind was not in our favour. After that Gael Scoil scored 1-2 but Sallins came out on top scoring 2-2 in the second half. The final score was Sallins 4-6 – Gael Scoil Chill Dara 1-4.